Mamma Mia! Here We Go Again: Specifically the soundtrack but also the movie. To know me is to know I love ABBA and musicals so I was going to be hard-pressed not to like this movie. That being said, I was concerned about the absence of Meryl. And while that did bother me a tad, no spoilers, this new story made up for it. Lily James was brilliant as young Donna-what a voice. I also found myself majorly loving the costumes, that seventies Bohemian thing though yass. Seriously though, Mamma Mia 2 is a good time. An emotionally charged time but a good time no less. Do it. Scattered Light: Hourglass have been on fire with their new releases. I loved their concealer, dropped a few months back and have heard equally good things about their loose powder and mascara. Today though, we have their new glitter eyeshadows. Think cream to powder and you can layer up the glitter, depending on what takes your fancy. I have the shade Reflect, a champagne hue which is versatile enough to throw on whenever. I like to layer it with other glitters; pigments and liquid shadows but it works equally as well on its own. The formula of these reminds me of the pressed glitter in Charlotte Tilbury's eyeshadow palettes. Velvety and budge-proof. Love love love. 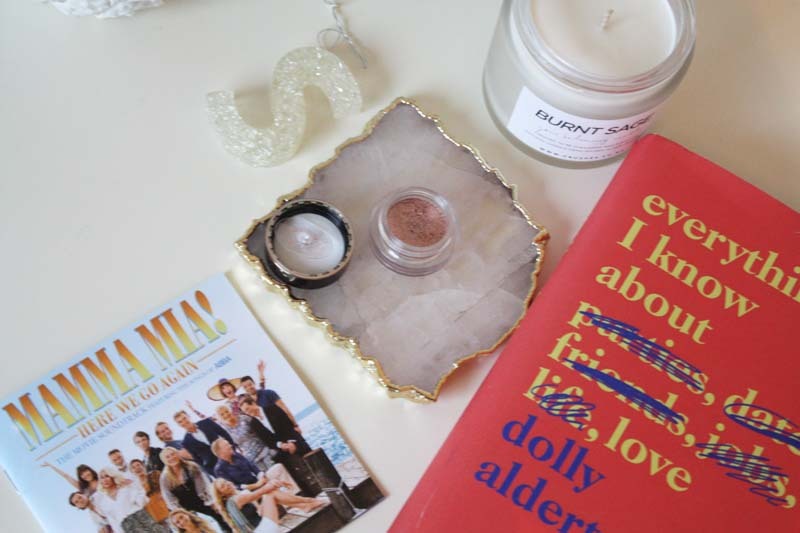 Everything Dolly Alderton Knows About Love: This is really one of those books I think everyone should just read for themselves and discover its brilliance in their own way. That'd make this the shortest paragraph ever so here's what I said on Instagram: "I wasn't sure what to expect from this book and it wasn't really until I started listening to Dolly's podcast that accompanies the book, as well as The High Low show that I really was like okay, I need to read this right now. Abandon all the other books. Which I gladly did. My god what a book. Brilliant, moving. Such a wonderful look at relationships, women and friendship in all its forms. I cried. I laughed loudly. I wanted to rip out pages and wallpaper my walls with them...I couldn't have read this book at a better time and really encourage you all to do so." Iconic Notebooks: Everyone's favourite tome, frankie have this trio of snazzy, fangirl notebooks. Susan Sarandon, Molly Ringwald, Debbie Harry. Perfect for jotting down equally as iconic prose and of course they're beautiful to look at.